Sometimes I just have to write about stuff because it is SO DANG COOL, even if it isn’t directly about volunteering and service travel. This is one o’ those. Selfie to Space gives you the opportunity to add your photo to the new test model of the LightSail, launching in a few days. The Planetary Society DOES, in fact, have some very cool volunteer opportunities you should check out, to be a space advocate and more great engagements. But about that LightSail thing–what the heck is it? It’s a citizen-funded space project — a solar-powered reflective sail using the sun’s energy for propulsion. It’s about 344 feet square and looks an awful lot like the big brother of those foil screens you put in your car’s windshield to block the sun on hot summer days. It heads into space all folded up into a cube the size of a loaf of bread, hitching a ride on other spacecraft until orbit, then it unfurls its mylar sails that are ridiculously improbable and delicate–less than 1/4 the thickness off a garbage bag. And your digital image will be on board. Theis project is happening thanks to Bill Nye the Science Guy the super science dude Neil DeGrasse Tyson. 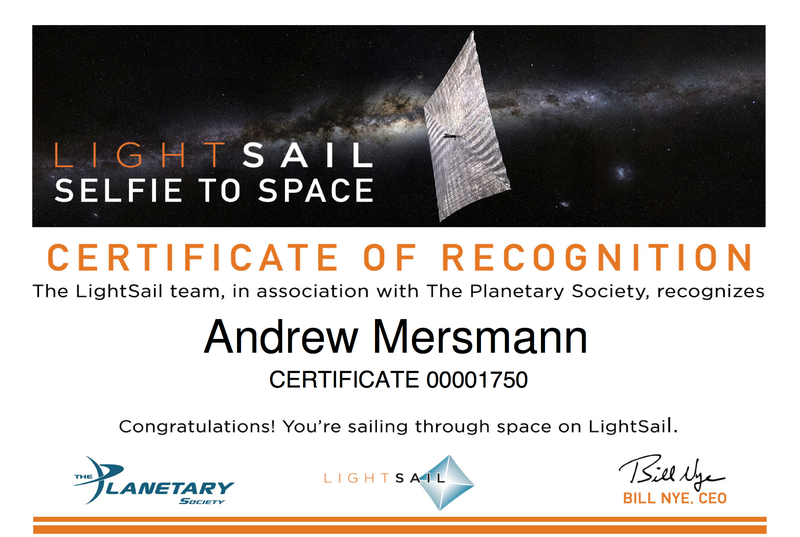 Sending your selfies is free — sign up, send the photo, Tweet about it (#SelfietoSpace), and you even get a certificate…but toss a few bucks at the project too (support link here). I’ll see you on board!